Last month, the Idaho Department of Lands said they received reports of people visiting a natural water slide near Priest Lake and were being asked to pay a fee. PRIEST LAKE, Id. — Efforts to crack down on people illegally collecting fees at natural water slides in North Idaho appears to be working, according to Idaho Department of Lands officials. Officials said they received reports of people visiting a natural water slide near Priest Lake in July and were being asked to pay a fee. According to IDL, the area is free to the public and the individuals who tried to collect fees were breaking the law. The department has since added security patrols to the area. 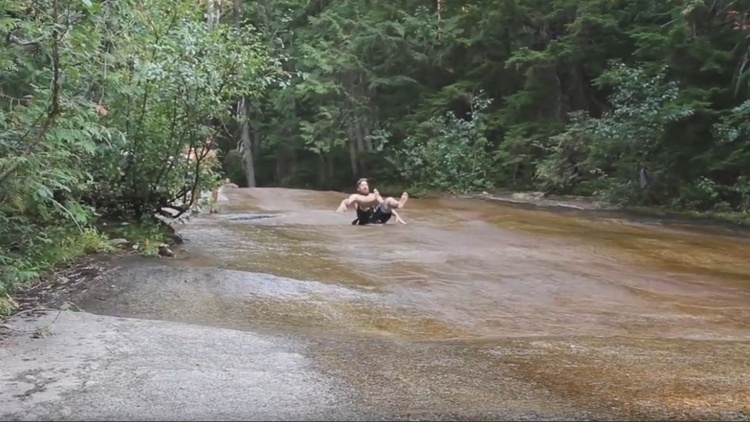 The natural water slide, which consists of smooth rock and a stream, is located on the northern end of Priest Lake. Users hike to the stream and often use trash bags to slide down the rocks. "We certainly, as an agency, have an obligation to follow up on any calls that we receive from the public about unauthorized use of endowment lands," Emily Callihan, an IDL representative, said. Officials said they have reason to believe they have found the suspects who were charging people for visiting the natural water slide. "Basically,what happened were some conversations between these individuals, our contractor and law enforcement," Callihan said. "As a result of those conversations, we have not had any issues in there since July." Bonner County Sheriff's Office officials said they heard rumors of people charging a fee in the area as early as 2017. They sent undercover detectives into the area, but did not find the suspects at the time.